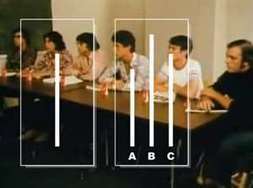 Classic footage from the Asch conformity study. This version includes definitions of normative and informational conformity and the powerful effect of having an ally. This program explores the psychological concept of conformity. It examines classic experiments by Sherif, Asch, Crutchfield, Bond and Smith, and Hofling. It looks at Milgram’s obedience study; outlines factors influencing obedience and conformity, including the ways in which such factors as age, self-esteem, and culture determine probability toward compliance; and looks at the cognitive process of groupthink. This film examines classic research asking why people conform, obey, and dissent in various social situations and presents social psychology’s main findings and principles in the areas of conformity and independence. Sherif’s experiments on norm formation, Asch’s work on group pressure to conform and Crutchfield’s variation, Kelman’s three processes of compliance, and Moscovici’s theoretical views are all covered.